“The Alliance for Securing Democracy is advised by a coalition of neoconservatives and liberal interventionists, from Bill Kristol to former CIA director and Clinton surrogate Michael Morrell. The group’s research is handled by even sketchier characters, like Andrew Weisburd, a right-wing homophobic, anti-Muslim activist with a long record of online harassment. “After publishing murderous and homophobic fantasies about Glenn Greenwald on Twitter, Weisburd boasted about listing Greenwald’s outlet, The Intercept, as a vehicle for Kremlin influence. The Alliance for Securing Democracy is currently sponsored by the German Marshall Fund of the United States. 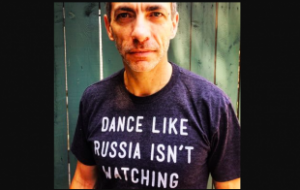 “Another Securing Democracy fellow, Clint Watts, has urged American intelligence agencies to encourage jihadists to carry out terrorist attacks against Russia and Iran.